St Joseph’s SMA Parish Church, Wilton, Cork – Saturday, 3 November at 3pm. African Missions, Dromantine and SMA House, Claregalway – Sunday, 11 November at 3pm. Though most SMA seminarians, brothers, priests and bishops are buried in Wilton cemetery (321), some are buried in other parts of Ireland. 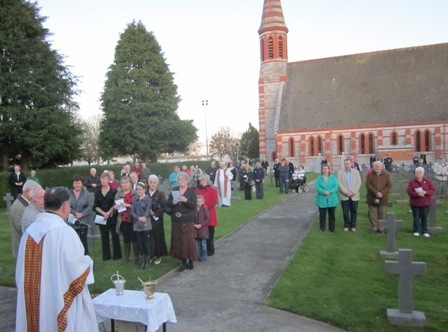 Two SMA priests, Fathers Paul Simon and J D Barrett and two seminarians are buried in St Joseph’s cemetery in Ballyphehane, Cork. This cemetery was once the property of the SMA. Our photo shows family members gathered at the graves of their loved ones during the prayers after Mass. A large number, especially in the early years of the Society, are buried in different parts of Africa, from Egypt in the north to Zambia in the south; from Nigeria and west to Liberia. The names of 163 of them – buried in other parts of Ireland or beyond its shores – are inscribed on 5 large Memorial stones in Wilton cemetery. Each Remembrance Day some of their relatives will gather there during the Blessing of graves after the Mass. The SMA Founder, Bishop de Brésillac and his first band of missionaries who were buried in 1859 in Freetown, Sierra Leone, are now reburied in the SMA House in Lyons, France. 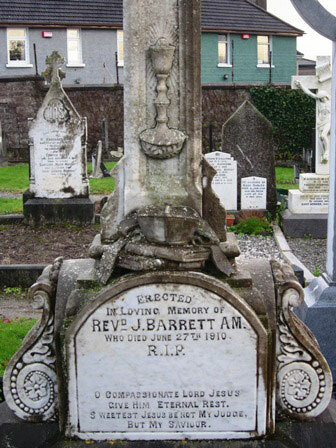 The decorative features on the headstone of Fr Barrett in St Joseph’s cemetery are very interesting. It is in the shape of a Cross with a Chalice and Host above the Stole and Biretta of a priest. These are, in turn, placed on some books, perhaps symbolising the Bible and the Breviary (the Prayer Book for priests).